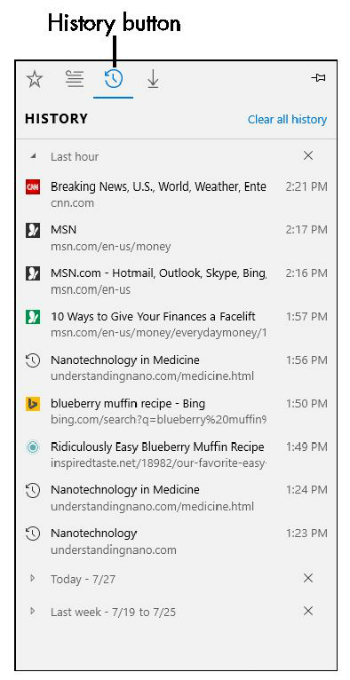 If you went to a site recently and want to return there but can’t remember the name, you might check your browsing history in Microsoft Edge’s Hub to find it. 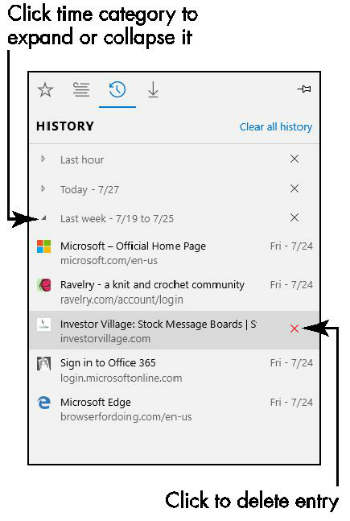 In Microsoft Edge, click the Hub button in the address bar and then click the History button (with the clock face on it) in the Hub pane to display the History list (see the following figure). As the History list accumulates items, it groups them by date, such as Last Hour, Today, and Last Week. You can click any of the time category labels to expand or collapse the entries in the group (see the following figure). Once you’ve expanded the desired time category, you can click an item to go to it. The History pane closes. To delete a single item from the History list, move the mouse pointer over it, and click the Delete (X) that appears at the right. (Refer to preceding figure.) You can also right-click the item and click Delete. To remove all the history items, click the Clear All History link at the upper right in the History pane.